Based on heavily modified Unreal Engine 2.5 with Havok Physics, Ubisoft with cooperation of NVidia, Splinter Cell: Blacklist now supports DX11 features like Tessellation, HBAO+, and NVidia’s TXAA (Temporal Anti-Aliasing). The game also offers supplementary graphics menu – more modes for anti-aliasing (FXAA,MSAA, SSAA) and ambient occlusion (Field AO, SSAO, SSAO+, HBAO), texture quality and filtering, and parallax mapping. With these features, you can create a modern, nice looking game. Can these features hide the true face of an aging engine? Our system processor is a little faster than the required 2.13GHz and we have plenty of RAM but we also tested with 2GB. Our GeForce 9600GT video card is right on the minimum which is also the direct competitor of Radeon 3870 during their time. This also means that you can play the game with 5 year old video cards, 880GT for example. We selected the beginning of Safehouse mission which is set to Benghazi, Libya. The level has lots of people and objects to render enough to stress our system. We used 60 second Fraps 3.5.9 benchmark three times to record the average and minimum frames per second. 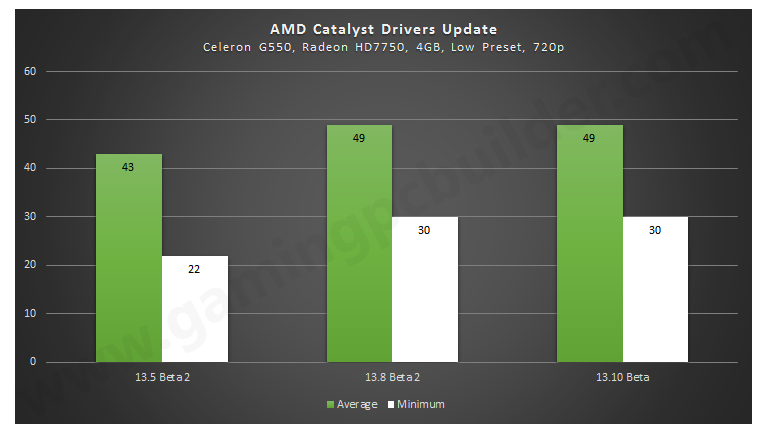 We tested different AMD Catalyst versions to see if drivers will give improvements. Updating from Catalyst 13.5 Beta 2 to 13.8 Beta 2 give overall improvements, improving both average and minimum from 6 to 8 fps. But updating further to 13.10 Beta did not give any improvements.